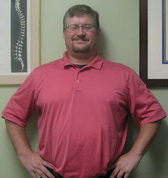 Dr. Nathan A. Carter, D.C.
Dr. Nathan A. Carter was born in Hernando County in 1971. He went on to graduate from Hernando High School in 1989. In 2005, he graduated from Texas Chiropractic College with his Doctorate in Chiropractic as well as a Bachelors in Biology. He spent 2006 as an Intern and Exam Doctor for Dr. Donald Hensley. While preparing for his Chiropractic boards, he spent the next 4 years teaching Anatomy & Physiology and Biology at both Nature Coast Technical and Hernando High School. He was brought back to The Hensley Center in 2012, after Dr. Donald Hensley had some unfortunate health issues that prevented him from continuing to practice. He spent the next two years trying to emulate Dr. Hensley and finally on June 2nd, 2014, he was given full endorsement to purchase the practice, which now carries the name: Carter Chiropractic and Wellness. With Carter Chiropractic and Wellness, Dr. Carter is now dedicated to delivering the same level of care that has made The Hensley Center such an important healthcare entity in Hernando County since 1953.